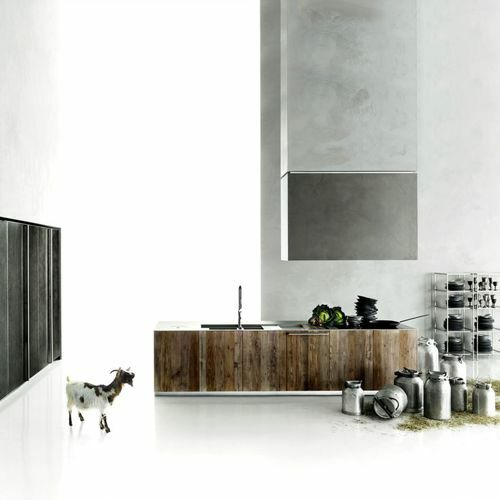 Extractor hoods use an innovative externally vented system, and the project is further complemented by stainless steel legs on breakfast bar tops in solid wood. Top-mounted units are available with open face or sliding door options, with integrated lighting and available in different finishes; they can be used between worktop and bar top as well. The project uses standard existing specifications and sizing for the carcasses, with the benefits this brings for unified modular integration. The doors can be made of solid wood staves in several widths and thicknesses, in order to create a 3d effect with the handle - which is built into the thickness of the door. The doors are treated with natural oil. Bearing structure: units in melamine-coated open-pore grey-graphite oak or silk white. The handle is inserted in side or upper door edge thickness. Finished doors: Lasermat and Silcover; Decomat; laminate; stainless steel; aluminium; wood veneer (full range of wood finishes available from Boffi); 3D wood (solid or veneer); solid wood; polyester; Ecolak; Metals; Corian®. Worktops: with basin effect, recessed or not for the exclusive cooktops, th. 55/56/60/110/190 mm. Finishes, th. 60 mm (visible thickness: 10 mm): matt satin stainless steel - Corian® - stone - marble - granite (complete range except for Bihara stone). Finishes, th. 55 mm (visible thickness: 5 mm): matt satin stainless steel - C.R.S. Scotch Brite stainless steel.